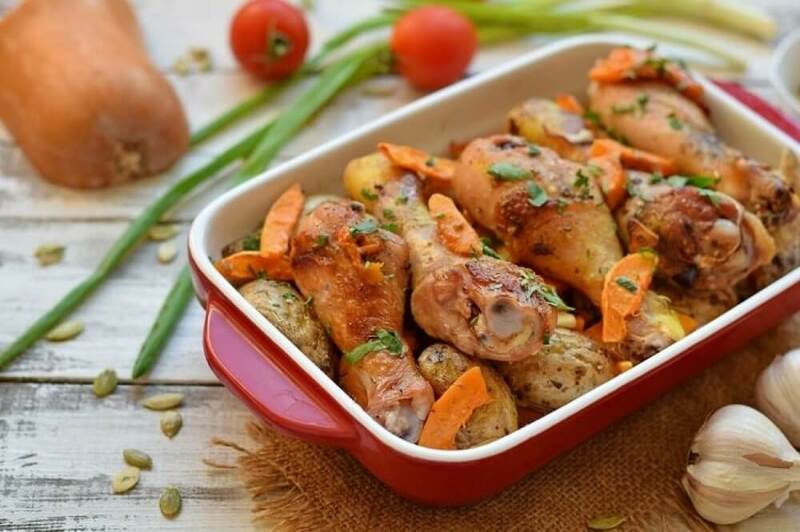 By the example of this recipe I am going to show you how appetizing at first glance a travial dish - chicken baked with pumpkin and potatoes in the oven may look. 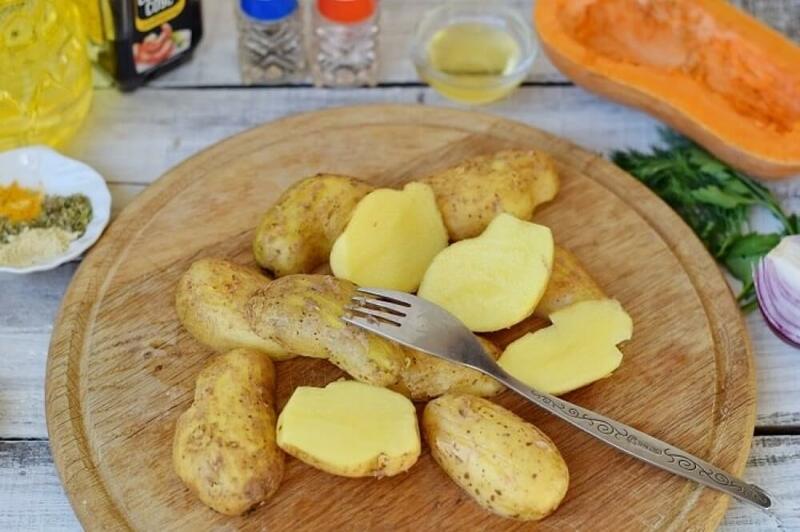 The originality of the recipe is in the potatoes, which are baked in their jackets and in a spicy pumpkin added to the basic ingredients. 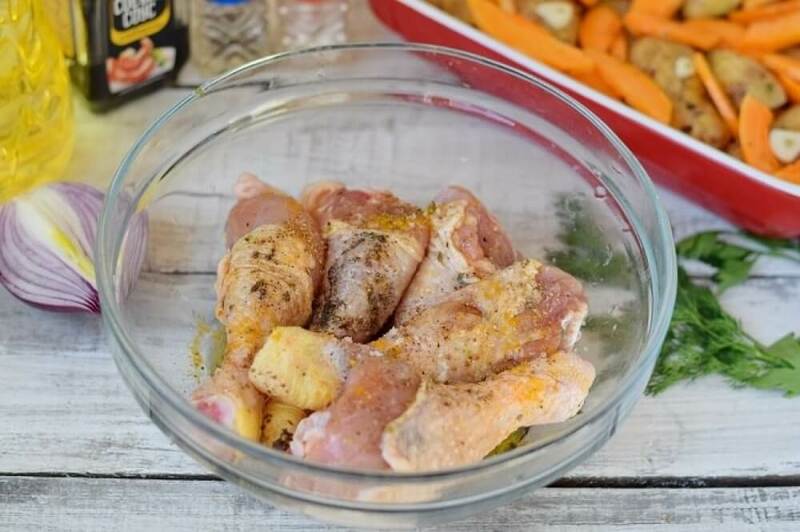 The highlight of the dish is also flavored sweet-and-salty marinade, seasoned with a great set of spices. 1. 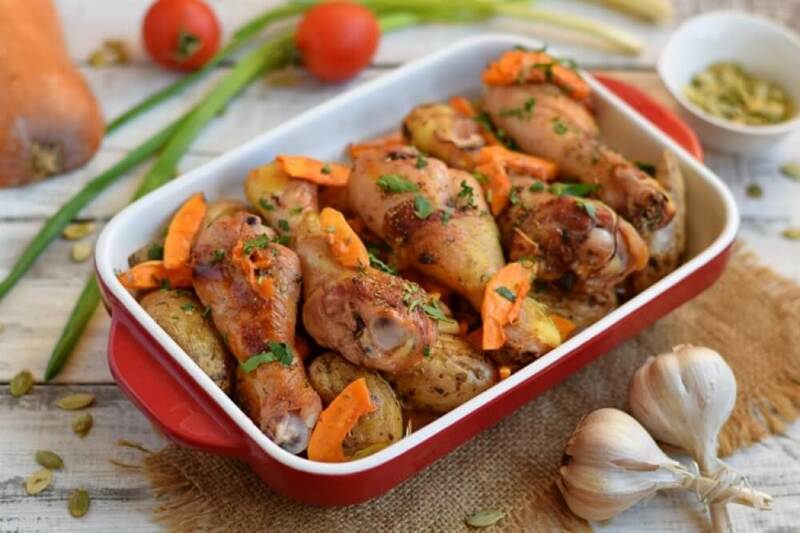 The potatoes for baking should be of a small or medium sizes, so that the root crops will be baked inside better and faster. 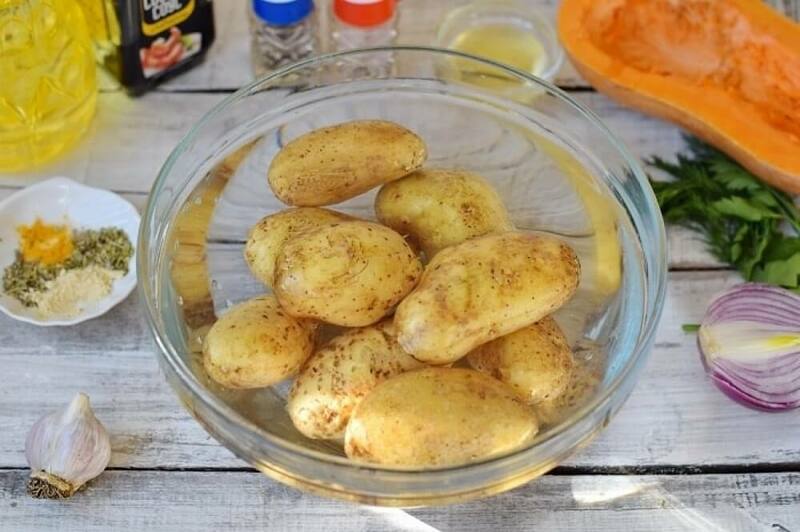 Put the potatoes into water for a few minutes, after that it will be easier to remove the dirt, then scrub them with a brush, rinse under running water and dry with a towel. 2. Then scrape the peel of the potatoes with a fork on all sides, cut them into two or four parts, depending on the size of the potato ball. 3. 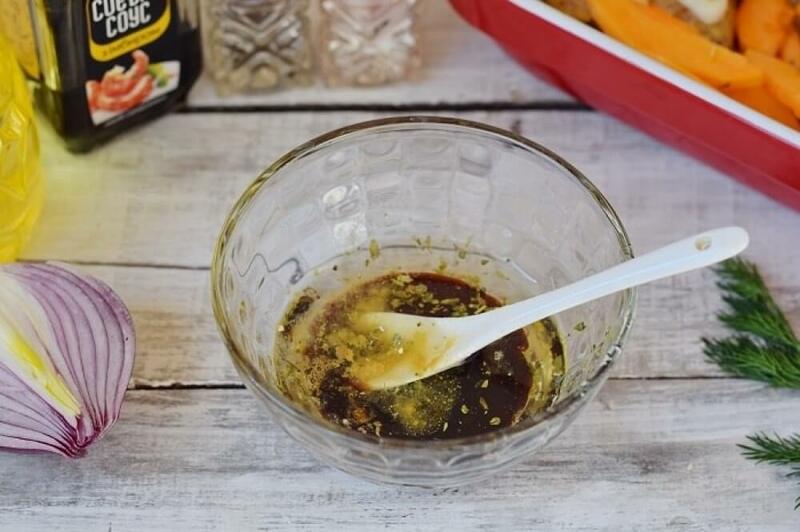 In a separate bowl prepare the marinade by combining oil, honey, oregano and Provencal herbs, mix well. 4. 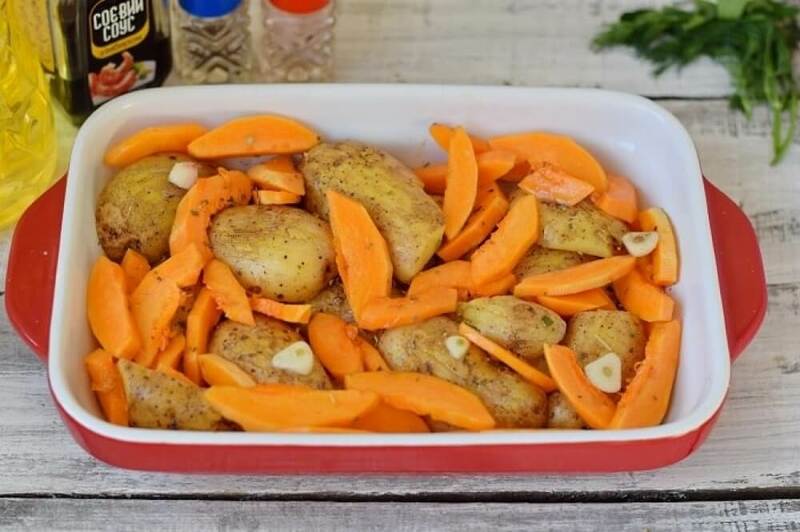 Lay the pieces of potatoes on a baking sheet or in a heat resisting pan, season the top with salt and pour with the third part of the prepared sauce. 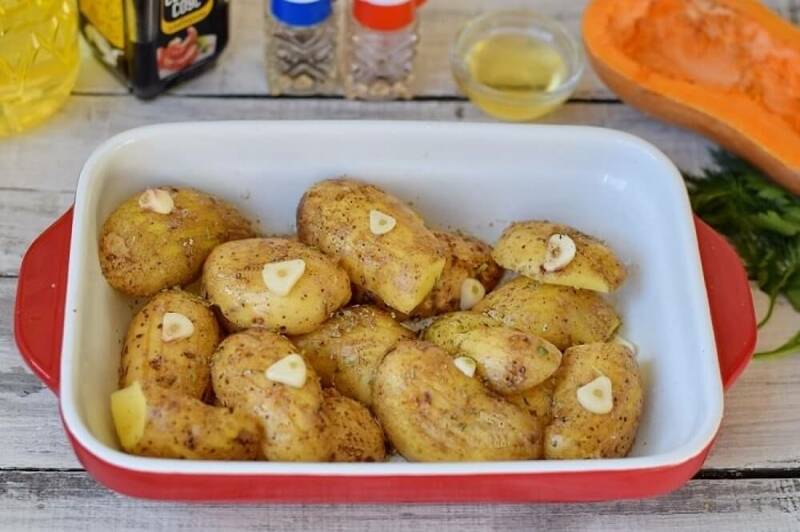 Release the cloves of garlic from the top layers, cut into slices and place on the potatoes. 5. Clear the pumpkin of a hard peel, remove seeds, cut into slices of medium thickness. 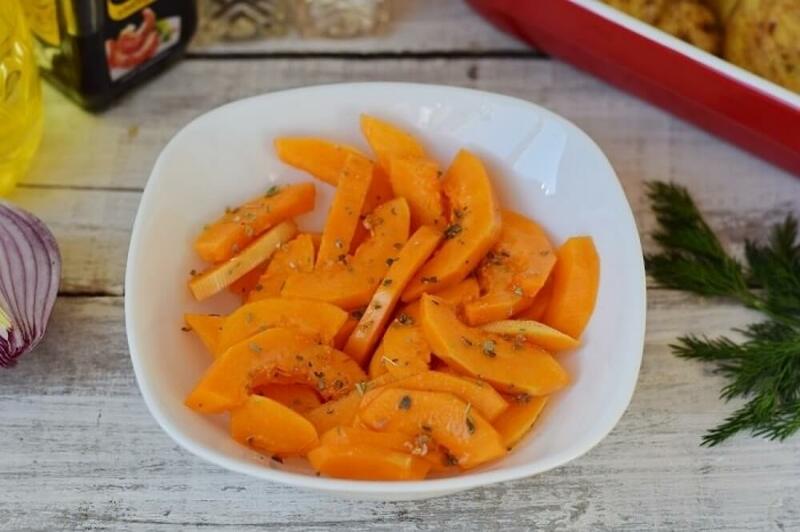 Lay the slices in a deep bowl, pour with the second part of the marinade, stir, sprinkle with salt. 6. Place the spicy pumpkin in the pan over the potatoes. 7. Then add the soy sauce, dry ginger, turmeric and pepper in the remains of the marinade, stir, season with salt if necessary. 8. 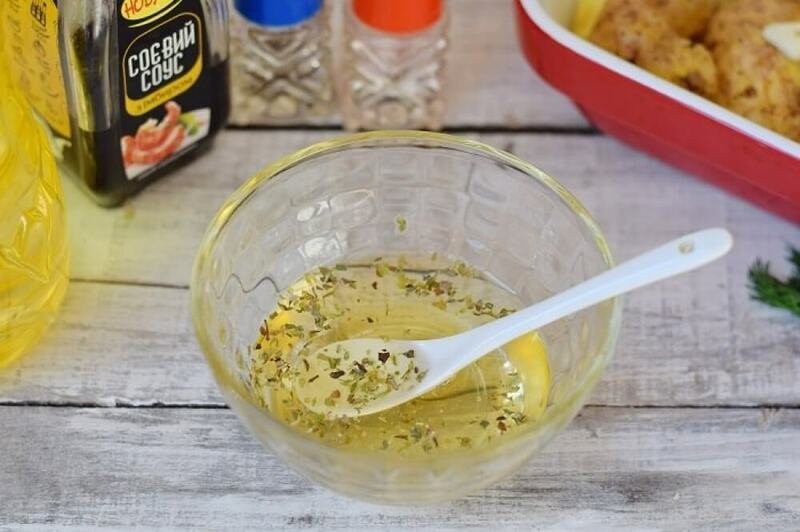 Wash the chicken sticks, dry them with a towel, put in a deep container, pour all the marinade in, leave it to stand for 15 minutes for the sticks to be soaked finely. 9. Next, place the chicken on the pumpkin and the potatoes, and decorate the top with the rings of an onion. 10. 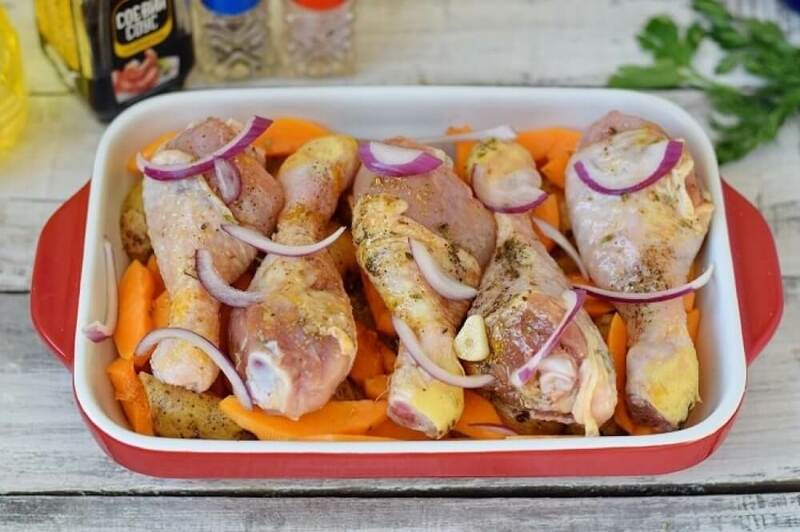 Cover the pan with foil, load into the oven. The cooking time is about 60 minutes, temperature is 180 degrees. Remove the foil 15 minutes before the end of the process and bake the dish in the open pan. 11. The onion rings can be removed before serving (if they are fried heavily). Decorate the dish with greens.